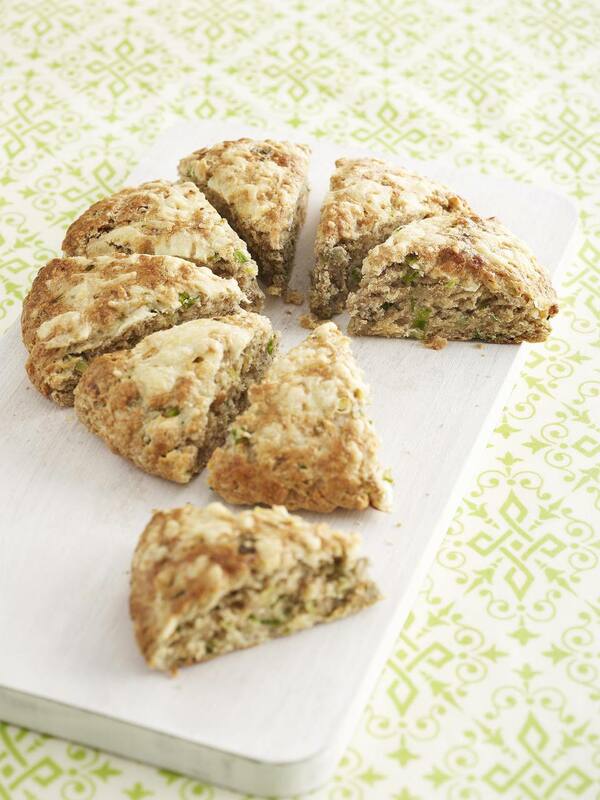 These savory and tender Onion Scones are really best served right out of the oven, slathered with butter. They are delicious served with any soup or stew, or as part of a bread tray for brunch for those who would rather eat something that is not so sweet. Scones are quick breads, but the dough is stiffer so it is just formed into a round on a baking sheet, cut into wedges, and baked. By the way, the amount of baking powder is correct; one tablespoon. Be sure to use baking powder, NOT baking soda, or the recipe will not work. That's a common mistake made in baking. Baking powder is made of baking soda plus an acid, so the soda will foam and add air bubbles to the batter. This is a great recipe for beginning cooks to make because it's so easy. You don't have to cut shortening into flour and there's no messing around with measurements. In a small microwave-safe bowl, combine the yellow onion, green onions, garlic, and butter. Microwave on high for 2 minutes, then stir this mixture. Microwave for another 1 to 2 minutes or until the vegetables are tender. Remove the bowl from the oven and let the vegetables cool for 10 minutes. Combine the flour, cheese, sugar, baking powder, pepper and salt in large bowl and stir to mix. Add the sauteed onion mixture to the flour mixture along with all of the melted butter, light cream, and egg. Stir just until combined with a spoon. Gently press the dough together with your hands to form a ball. On an ungreased cookie sheet, press the dough into an 8" circle. Cut the circle into 8 wedges, like you were cutting a pie. Separate the wedges slightly. Bake for 12 to 15 minutes or until the scones are lightly browned. Brush with more melted butter and serve immediately.